I am so excited to be here today on Pamela's blog, or should I say honored? I am Liz from Lizmarieblog.com & I pride myself on being a child of God, marine wife, dog mom, interior designer, & a blogger. My passion for home decor & DIY started at a very young age & it has never stopped. 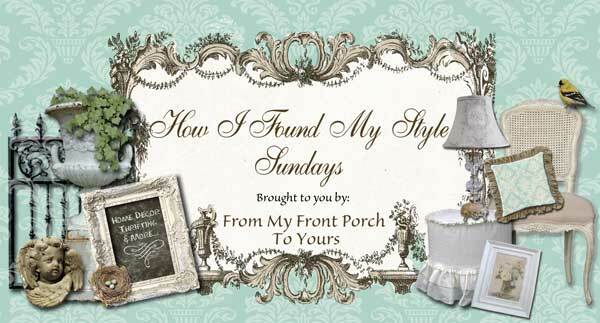 Today I wanted to share with you a little about my style & my advice for achieving a style in your home that you will love too! 1- My decorating style is? Eclectic Cottage. 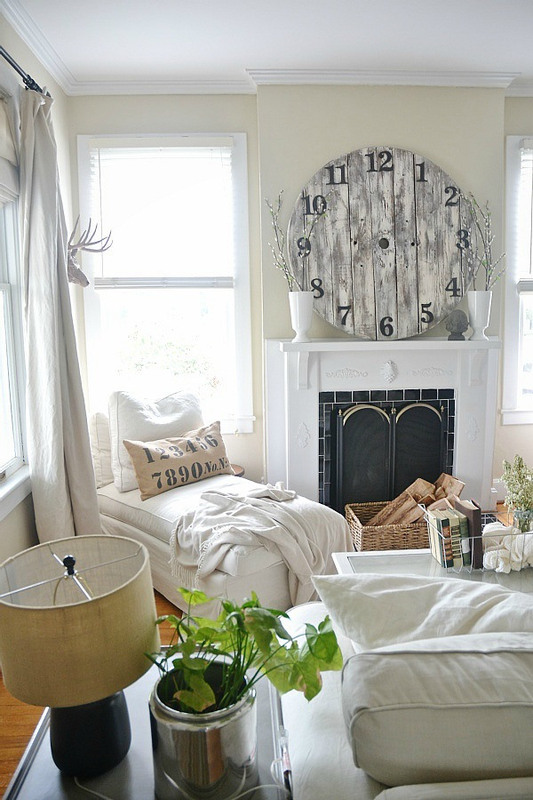 A cozy cottage feel with eclectic finds. 2- How did you "find" your decorating style? I have always enjoyed eclectic rustic spaces. Growing up we had an old 1950’s cottage that we would go to on the weekends & it was a modge podge of furniture & it was super eclectic. It felt so homey & it was decorated in the most frugal way so I guess that’s how I grew up & what I think is beautiful. 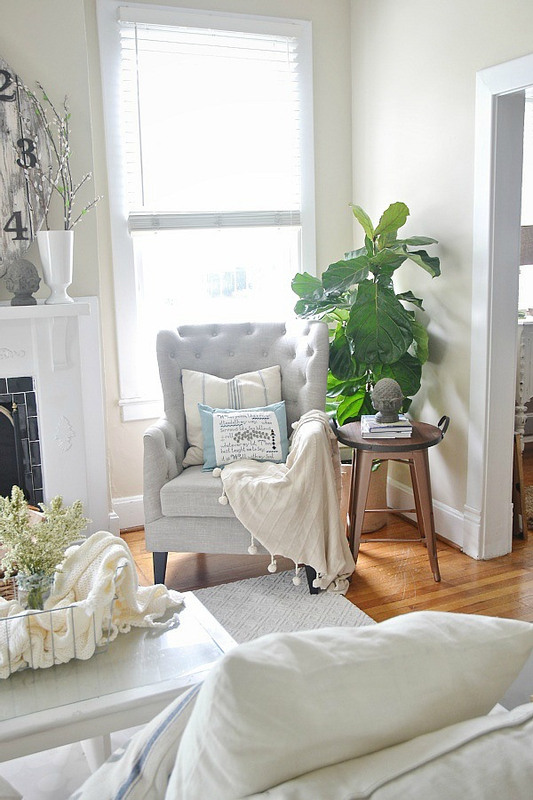 I like the decor to look like it was collected over time & not thrown together in a day. I always grew up going to antique & vintage shops & I think that aesthetic has always appealed to me. 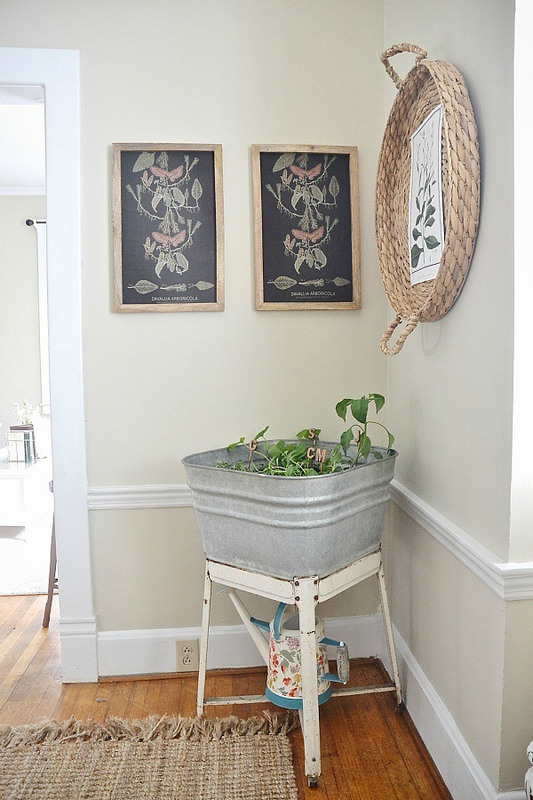 3- What has been your most treasured find for your home? Our massive “card catalog” drawers that we found this year at a local antique store for around $100 it needs a lot of work, but it seriously beautiful & a huge focal point in our house. 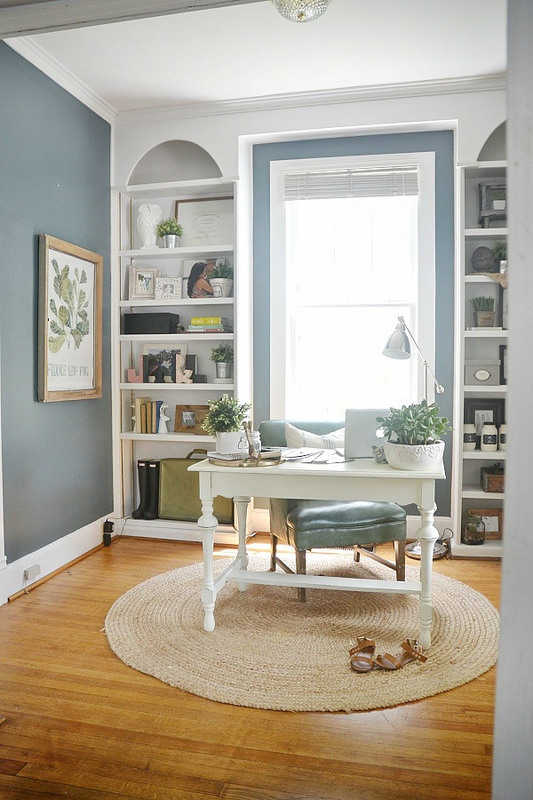 4- What tips do you have for creating a beautiful home? My biggest tip is to collect things over time, don’t rush it, when you collect things you find your style slowly & it won’t be forced. I started with neutrals & built on that with my eclectic vintage finds, department store finds, & things that I already had. Starting with a neutral base really helps things not look cluttered as well. I hope these small tips help you when decorating your own space & always remember to use the things you love because you are the one that will be living in the space! Be sure to find me on my blog, Facebook, & Instagram for all things home decor, DIY, & everything lovely. Liz thank you for stopping by and sharing with us today! I have enjoyed following along with your blog and seeing your updates on FB and Instagram. Love her style, so pretty. Great choice Pamela. Liz's home is so charming. Love that card catalog what a great find and I love her little doggie photo bombing the shot LOL! Too cute. 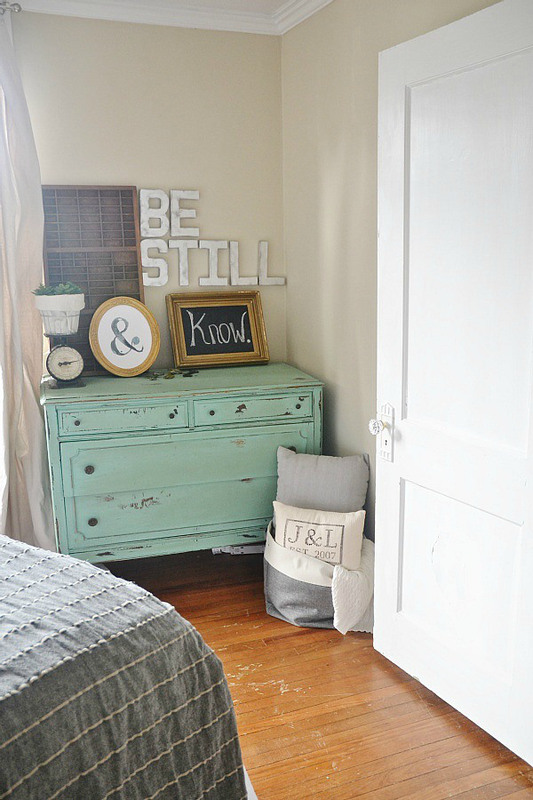 Thanks for featuring Liz's charming home. I am heading over to her blog now. Liz has a beautiful home! I love her decorating style. She's got so many great ideas going on here. 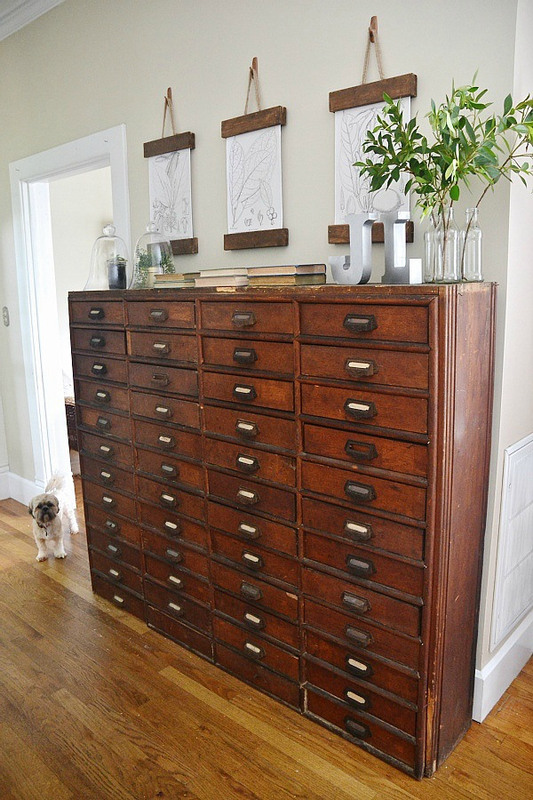 Love that card catalog ~ what a fantastic find and statement piece. 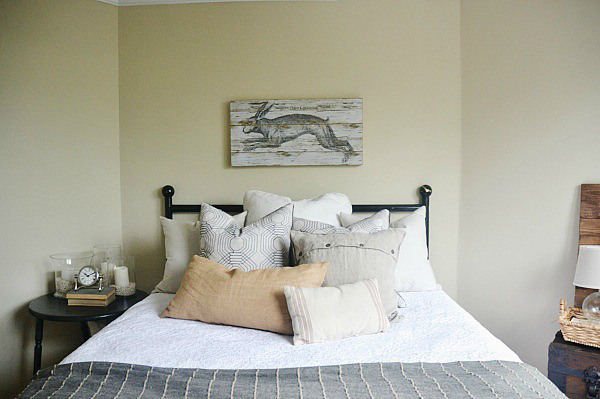 Love her bunny sign over the bed, too. Love her house! I have card catalog envy. What a lovely home! I love the card catalog file; what a fantastic statement piece! I have enjoyed learning more about Liz! Thanks for sharing her lovely home! Liz Marie was one of the first blogs I followed. I love her style and her sweet authenticity. Thanks for having her as a feature Pamela. Blessings to you both!